Aquaponics is the symbiotic hydroponic system that involves raising fish and produce in an integrated setting. Crops are held in place in a raft bed that suspends the plants in nutrient-rich water. Fish are raised in aquaculture tanks, and their waste is used as fertilizer for the plants. The plants reciprocate by filtering the water for the fish. This creates a system that utilizes natural biological functions to produce a healthy, profitable product. 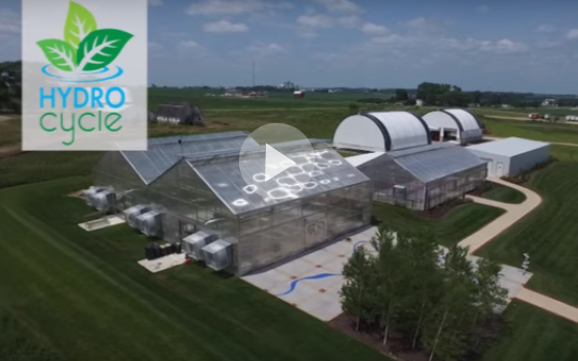 With HydroCycle Aquaponics Systems, any business can gain an advantage. Experience the benefits of a natural, correlative relationship between plants and fish, all year round. HydroCycle’s Aquaponics Specialists work with each customer to help them determine the systems and designs that are right for them. Together specialists and customers create a system that compliments their operation and promotes a more profitable business. GrowSpan can also construct an ideal aquaponics greenhouse, allowing growers to produce both plants and fish on a continuous, year-round basis. The HydroCycle Aquaponics Systems are a great option for small-scale professional operations or the hobbyist. These systems are commonly used in the classroom to teach aquaponics growing or to display the relationship between the plant and animal world.